This dish is similar to my preserved black bean chicken dish, but it should be considered the simplified version. Easier and quicker. I cooked it this way to save some time and effort, actually. Since this is just a resemblance dish for settling our dinner with a quicker fix after being worn out by all my festivities since last year end, I didn’t thought of posting this, actually… But, to my surprise, papa said this version yields even better taste than my original version. The version which I’ve learned from the tv cooking program of the celebrity chef (laugh)! 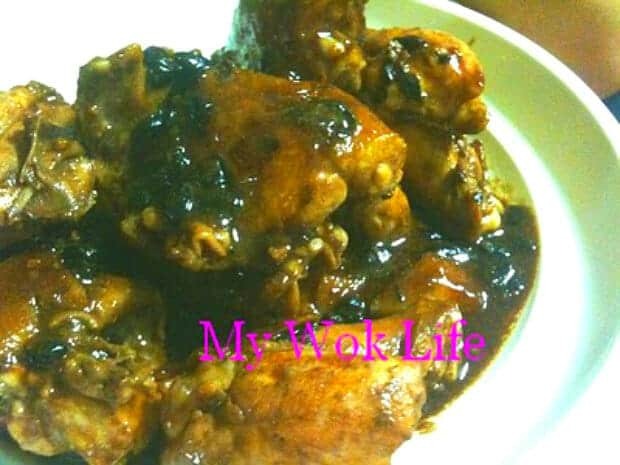 1) Season chicken with light soy sauce and sesame oil for 20 minutes or longer. 2) Heat wok with oil over high fire. Add 2 ginger slices and sauté for a bit while, followed by garlic, sauté both till fragrant and lightly browned. Add in chicken and stir fry it for 3 minutes. Add in whole black bean, stir to combine. Reduce heat to low fire, cover wok with lid for 5 minutes. 3) Add in soy bean paste and sugar. Stir fry to combine well. Let it cook for another 5 minutes or until chicken is cooked, with or without lid on. Heat up to high fire to stir fry for 1 minute before heat off. Dish up. Serve with hot steamed rice. A portion of my bean paste chicken stir fry counts about 260kcal. Tips: Use of olive oil in seasoning the whole black bean gives smoother texture after cooked. If really can’t get any olive oil, use normal cooking oil in a slightly lesser amount. * Whole black bean is not so popular in supermarket. Try finding it from neighborhood minimarts or provision shops. Or, many provision shops in Chinatown. It usually comes in small packing. If bottled, it’s usually seasoned in oil (you may then skip the addition of oil in your seasoning). Ask the shop keeper for help!